The haftara for Shabbat Chol Ha-mo’ed Sukkot (Yechezkel 38:18-39:16), which deals with the war of Gog and Magog, is one of the most famous prophecies in Scripture. It has succeeded in taking hold of the human imagination and penetrating deeply into our cultural and religious consciousness. The destruction of the existing and imperfect world, the ultimate war against evil, the heavy price of blood, and God's victory over men of flesh and blood are powerful images that leave a profound impression on the human soul. Thus, this prophecy has become part of the inalienable property of the Jewish and general world. In answer to this question, Rashi (Megilla 31a, s.v. be-yom) identifies the war of Gog and Magog with the war fought in the end of days that is mentioned at the end of the book of Zekharia in the chapter that serves as the haftara on the first day of Sukkot. As Rashi puts it, "'On that day, when Gog shall come' is the war mentioned in Zekharia in 'Behold, the day of the Lord comes.'" Indeed, there is significant correspondence between these two prophecies. Both deal with a future war of defense fought against nations oppressing Israel in which God Himself rises to fight against the enemies of Israel, making use of very similar methods of fighting. Both campaigns are decided by way of supernatural means introduced by God, the focus of which is a great earthquake that utterly overturns the regular natural order, as a result of which pandemonium breaks out, causing "every man's sword to be against each other." From this perspective, we can certainly speak of very similar accounts issuing from the mouths of Yechezkel and Zekharia, and conclude from this that we are dealing with the same war, as is argued by Rashi. Based on this, we can explain why we read the story of Gog and Magog on Shabbat Chol Ha-mo’ed Sukkot, for the prophecy in Zekharia makes explicit mention of the festival of Sukkot. According to Rashi, the two haftarot read on the festival of Sukkot deal with the terrible war that will take place in the future, "on that day," for they are one and the same war. On the first day of Sukkot, we read the account of that war as it appears at the end of the book of Zekharia, mentioning the festival of Sukkot at the conclusion, and on Shabbat Chol Ha-mo’ed, we read Yechezkel's account of the same war. If you'd like a glimpse of what the world might look like after another four years of an Obama White House - years in which he no longer has to measure his actions against re-election - then click the picture to see Dinesh d'Souza'a excellent film "2016 - Obama's America." Those who ignore his bringing the Muslim Brotherhood to power across the Middle East will never understand that the ultimate goal here would necessarily be the elimination of the "colonialist Zionist entity." Look for updates to be added here throughout the day as needed. A lot is happening in the world and I’ve been so busy with family business and holiday preparations that I’ve not been able to respond to it. However, it's just as well since the situation is being clarified even as I write. If you're reading this, then you are connected to the internet and there is no way that you can not have heard about the attack on the US consulate in Benghazi, Libya that killed the U.S. ambassador to Libya and three other Americans. Supposedly, this was the result of "spontaneous" riots which broke out in response to an anti-Islam film which was attributed to an "Israeli Jew living in California." In Cairo, also, riots broke out near the embassy and the US flag was burned and replaced with an Islamic one. Within twenty-four hours, however, new reports have emerged that a group of Egyptian Christians were responsible for the film and serious questions have been raised about how "spontaneous" the reaction really was. There are reports that rioting is continuing in Egypt and has spread to Yemen, Bangladesh, Tunisia and Morocco. In response to the murders in Libya, the US is sending in two warships carrying Tomahawk cruise missiles. And lest we forget, there is still the situation with Syria and Iran which deteriorates by the day. As if this were not enough, we've got a talking head at NBC asking a representative of the group who made the anti-Islam film who is really more dangerous to the world, the "Supreme Leader" in Tehran or "Bibi" Netanyahu? He went on to say that the only way to get along with Netanyahu is to agree with everything he says. The scary part is not that people say these things, it's that they say them openly and unabashedly. There is no shame in it and this bodes ill for Jews in chu"l particularly. We are living in generally scary times and it's getting worse. We're more informed than ever and yet we have no idea what can be believed. The relationship between the US and Israel may or may not be as tenuous as reported. Some have hypothesized that the 'bad blood' between the President and the Prime Minister could all be a magnificent act meant to fool the leadership of Iran while they secretly plot its downfall together. Still others think the Libya attack might be a false-flag event intended to cover up the real reason for warships in the Mediterranean - an invasion of ISRAEL meant to cut her down to size and prevent her putting the whole world at risk with her insistent demand that Iran be denied nuclear power. Only Hashem knows what's really going on. It's up to us to have faith in Him that He does everything for our very best and He is the One ultimately in control. The power of life and death are in His hands alone. However, it's worth noting that it is highly significant that this started on 9/11 on the eleventh anniversary of the destruction of the Twin Towers. The number eleven is itself highly significant. And just as that first 9/11 led to war on Hoshanah Rabbah 5762, the events which began on this 9/11 may finish that war on Hoshanah Rabbah 5773. We will have to watch this play out over the days to come, but I have the feeling that events might converge and cascade until we could have a real shot at GoguMagog on Hoshanah Rabbah 5773 just as predicted. 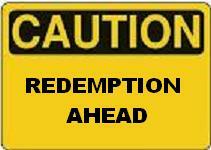 If so, then history may very well show in the end that the Redemption began right at the closing of the year 5772. May each one of us be inscribed and sealed for life and health and a future. May each one of us live and survive to greet Mashiach Tzidkeinu and merit to live in days of Mashiach and the rebuilt Beit Hamikdash in peace and love and joy. ...Murdoch also said, "Twenty years ago my company invested in a small company in a small Jerusalem apartment, and what I gained from this company in terms of capital returns and technologically was critical to my company in the last few years." “There are more than $11 billion in foreign investments in Israel. Usually we invest in assets that generate the best returns and Israel is too good for investors to ignore it. "We once thought that G-d chose a Holy Land without any oil or natural resources, but recent years have shown that Israel has incredible resources with enormous oil and gas reserves". Murdoch added, "What differentiates Israel from other countries is the creativity. Israel is successful because it is one of several countries whose economy revolves around the human mind, and it is really a light unto the nations. Today is the eleventh anniversary of 9/11 according to the Hebrew calendar. Supposedly the name "Uncle Sam," referring to the United States, comes from the two initial letters (US). But, it really has a much deeper meaning. "Sam" is also the name of Eisav's ministering angel, who also just happens to be the Angel of Death and the Yetzer Hara. ...Who indeed was this malach who had come to do battle with Yaakov? Rashi quotes Chazal (our Sages) who identify him as "Saro shel Eisav - the ministering angel of Eisav. (Bereishis Rabbah 77:3; Midrash Tanchuma 8)" The struggle, commentators explain, was not a simple wrestling match. The World Trade Center was the physical representation of "material trappings and ambition" in a city which represents all of that for the whole world. The fall of the Twin Towers was the physical representation of the spiritual fall of Eisav's ministering angel and the ultimate collapse of materialism as a power. It began with the launching of the war in Afghanistan on Hoshanah Rabbah 5762 and proceeded to the War in Iraq and until today when the US and Europe are teetering on bankruptcy. Eisav's ministering angel climbed so high up the ladder that the only way to come back down was to fall. And although it doesn't look much like it from where we are standing, that day the power of Yisrael began to rise. Remember when major events occurred once a century, then once a decade? Then, they started occurring every year - 2004 Asian Tsunami; 2005 Hurricane Katrina; 2006 Second Lebanon War; 2008 Economic Crash, etc. Then, things changed. Time speeded up. In 2010, there were massive earthquakes in Haiti and then Chile (which was also accompanied by a tsunami), as well as the volcanic eruptions in Iceland which interrupted air travel across Europe. Then, there was the explosion and resulting oil spill in the Gulf of Mexico. And that was followed by massive fires and a killing heat wave across Russia. The year 2011 was so bad, the BBC made a video detailing all the disasters and they called it The Year the Earth Went Wild. This speeding up of time and events is right in line with Terence McKenna's theories about Time Wave Zero. Today, I was struck by the fact that there were TWO tornadoes in New York at the same time over Shabbat, where even one is a rarity. And then, I saw that many articles (Google it) on the earthquakes in China were reporting them as "TWINS:" 81 Dead in Twin China Quakes And suddenly, I recalled that Hurricane Isaac made landfall TWICE at New Orleans! It made me think about what Yosef HaTzadik told Paro in regard to the doubling of his dream: (Breishit 41:32) - "And concerning the repetition of the dream to Pharaoh twice, that is because the matter is ready to emanate from God, and God is hastening to execute it." And what did we just read in yesterday's haftarah? "In its time, I will hasten it!" There is a discussion in the comments of the Unity post about whether the Land of Israel is enough to unite all the Jews. I do not think so. No one loves the Land of Israel more than I do, but we were united as one man at Har Sinai when we stood in the Presence of G-d Almighty and accepted His Holy Torah. Without Torah, the land is meaningless. It's up for grabs, as we have seen only too well. One commenter says that I am writing off "a huge chunk of Am Yisrael" by saying this. If they are "written off" through unbelief, it is not I who has done it. They've done it to themselves. 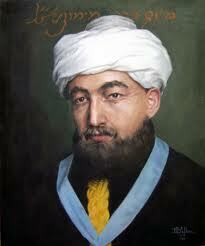 Read the Rambam on the essential beliefs which are required of every Jew. This is to accept that this Oneness that we have mentioned above is not a body and has no strength in the body, and has no shape or image or relationship to a body or parts thereof. This is why the Sages of blessed memory said with regards to heaven there is no sitting, nor standing, no awakeness, nor tiredness. This is all to say that He does not partake of any physical actions or qualities. And if He were to be a body then He would be like any other body and would not be God. And all that is written in the holy books regarding descriptions of God, they are all anthropomorphic. Thus said our great Rabbis of blessed memory, “The Torah speaketh in man’s language” (i.e. using human terms to offer some understanding). And the Rabbis have already spoken at length on this issue. This is the third pillar and is attested to by the verse, “For you saw no image” meaning that you did not see an image or any form when you stood at Sinai because as we have just said, He has no body, nor power of the body. I have expounded at length many things and I have left the topic of my composition but I have done it for I saw a need in the dealings of the fundamentals of faith and I have gathered together many different and spread out areas. Therefore know them and succeed in understanding them and review them many times and know them very well [i.e. not just memorization but to understand fully and to be able to support them and know their proofs]. Therefore if after one or ten times you think you have understood them, God knows that you are just involved in falsehood. Therefore do not read them quickly because I have not written them as it suddenly entered into my mind. But rather, after a deep and careful study of the whole area and after I have seen many clear and true ideas and I have seen what is proper to believe of them [as the fundamentals] and I have brought proofs and logical demonstrations for each and every one of them. May it be God’s will that I have been correct that He helped me through this area on the good path and now I will return to my explanation of this chapter [in the Talmud]. "Most Fateful Days in Israel's History"
Rabbis' and kabbalists' calculations aside, the daily news points to 5773 as the year of redemption. For have we not already been told that when Edom and Paras face off, it will result in redemption for Israel? (Debka 5 Sep '12) The third US aircraft carrier, USS Stennis, is moving into place off the Iranian Gulf coast to lead a 12-day naval exercise of 25 nations on Sept 16-27, that will include a large-scale minesweeping drill simulating the breaching of the Strait of Hormuz against Iranian efforts to block oil passage through the strategic waterway. ...The Stennis will join two other aircraft carriers, the USS Enterprise and USS Dwight D. Eisenhower, and their strike groups, which are already on operational duty off the coast of Iran, ready for the drill which kicks off in the strategic Strait of Hormuz on Sept. 16 [first day of Rosh Hashanah 5773]. US officials say the Stennis will replace the Enterprise, but according to DEBKAfile’s military and Washington sources all three carriers will remain in place opposite Iran in the Gulf region in the coming months. British and French warships are completing their transfer to new stations off Iran for the big exercise in which the Saudi and United Arab Emirates navies will also take part. In addition to practicing tactics for keeping the Strait of Hormuz open, the exercise will simulate operations for destroying Iranian naval, air and missile bases in the Persian Gulf area. Turkish army officers have assumed direct command of the first two Syrian rebel brigades fighting Bashar Assad’s government forces, according to DEBKAfile’s exclusive sources. This step has sent military tensions rocketing on Israel’s northern borders with Syria and Lebanon in case of a backlash. ...Turkey is considered to have stepped directly into the Syrian conflict marking the onset of foreign intervention. ...US, Turkish and Israeli intelligence watchers were reporting unusual military movements in Syria and on Hizballah turf in southern Lebanon – suspected of being preparations for a blowback from the Turkish intervention in Syria. ...The IDF countered by placing its units guarding the Syrian and Lebanese borders on a state of alert. Wednesday, Sept. 5, an Iron Dome battery was installed in Gush Dan to head off a potential Hizballah missile barrage on central Israel and its hub, Tel Aviv. ...military sources report that Thursday, Sept. 6, military temperatures remained high-to-feverish along Syria's borders with Turkey and Israel, and along Lebanon's borders with Syria and Israel. Former Head of Knesset's Foreign Affairs and Defense Committee, Tzachi Hanegbi, hints at timetable for Iran attack. "We now stand, in my opinion, before the 50 most fateful days in Israel's history, since perhaps the Yom Kippur War, in which there were also several dozen fateful days." So said the former Head of Knesset's Foreign Affairs and Defense Committee, Tzachi Hanegbi, at a closed meeting of Likud activists in Yafo. A recording of his speech reached daily newspaper Makon Rishon's reporter, Ze'ev Kam. "The prime minister will have to make decisions that will bear a price tag. Allowing Iranian nuclear weapons has a price tag. The practical result will be a nuclear arms race in the entire Middle East," he explained. "Today, when we say that we understand the danger of the Iranian threat, and understand that a confrontation bears a price, it is because we want to prevent our sons and grandson from paying unbearable prices," he said. ...When we stood at the foot of Har Sinai, we were united "like one man with one heart," according to Chazal. But, where did that unity come from? From within ourselves? Was it an ability to set aside all our differences and accept them with love, no matter how divergent? Emphatically, NO! We were not the source of that unity. We were the recipients! It was the truth of the Holy Torah that united us around it. I believe that only around the essential truth can we unite - even (and especially) today. This is something that should be self-evident. “There is no doubt that the desire to unite all sections of the national-religious camp into one big movement is something very important, but on the other hand, we must carefully examine the true values around which they come together,” he said. At a time when we are being urged to unify despite important differences, simply for the sake of unity, as if it alone will save us, this truth can not be overemphasized. Why do people persist in wanting to live in a dream world? Why do they refuse to face reality? Jews must acknowledge the hard facts - if they want to survive! THE ARABS ARE AT WAR WITH US! Since they don't have a state from which to launch a military assault upon us, they do the best they can with what they've got - our own stupidity! G-d have mercy and save us from ourselves! A Palestinian Authority Arab burglarized an apartment home and poisoned a Jewish family he worked for last November, police revealed Sunday. “I hate Jews,” he told investigators. Two other Arabs from the “Triangle” area near Netanya also were charged with the burglar but denied being involved in the poison attack. They had access to the home by using the keys to the home where they were working. When Eyal Lerner returned home one day, he discovered that items were missing. When police came to investigate, he fainted after drinking grapefruit juice that was on the table. Lerner has said that the juice had a strange taste. A later investigation revealed it was laced with poison. A volunteer policeman, Lerner’s wife Yifat and their two and half-year-old son also became ill after drinking filtered water, that later was found to contain cleaning liquid. All were hospitalized in light condition, except for Eyal, was in serious condition until making a full recovery. ...During the investigation, Arabs in Nasarrah’s village of Beit Furik stoned soldiers and police when they arrived at the house. They found poison in his home and also found stolen items in the home of one of the Arabs living in the Triangle. STOP GIVING THEM JOBS! THAT'S WHAT BROUGHT THEM HERE IN THE FIRST PLACE!! "If I forget Jerusalem...may my right hand lose its skill...."
The right arm is a symbol of power and strength. 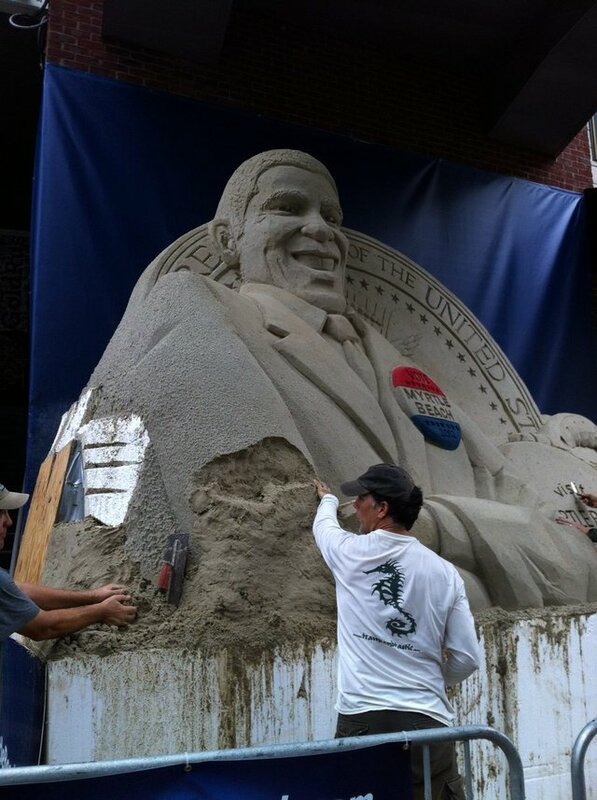 The sand sculpture was protected from above, and Mr. Obama's face didn't see too much damage. But the storm was so strong that its heavy winds blew the rain sideways, pelting the president's right side and leaving the sand pockmarked and completely erasing his right elbow. ...The large Rushmore-style sculpture drew comparisons to Mr. Obama's 2008 convention in Denver, when he accepted his party's nomination on a stage that looked like a Greek temple.